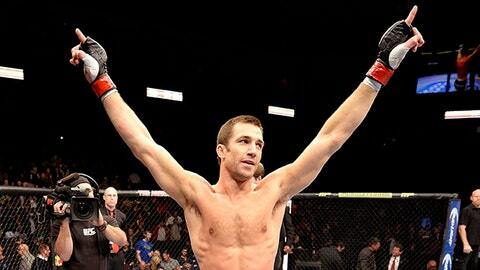 Luke Rockhold at 205lbs? Could be more likely than we think. The list of people who want to fight Michael Bisping grows by the day and now Luke Rockhold is doubling down on his challenge from last week. UFC Tonight’s Ariel Helwani reports that Rockhold is going to give it one last try to convince the UFC to book him against Bisping – it’s a fight he really wants. Rockhold initially called out Bisping following his first-round knockout win at UFC Fight Night in Duluth, Ga., on Jan. 15 against Costas Philippou. The American Kickboxing Academy product has wanted to throw down with Bisping ever since the Brit said a few years ago that he bested Rockhold in sparring once. At the time, Rockhold was the Strikeforce middleweight champion, so Bisping declared himself the true Strikeforce titleholder. Here’s the thing with Bisping, though: He’s still waiting to be cleared by doctors due to an eye injury and is already targeted for a fight with Tim Kennedy in April. Obviously, Rockhold will still likely see a middleweight title contender next, but he’s also interested in moving up to 205 pounds. He thinks it would be fun and has bandied about dabbling as a light heavyweight for awhile. It wouldn’t be a permanent change, though.